I’m generally never lacking in reasons for why cake is necessary in my life, so when something like Easter comes around, it really is the perfect excuse to get baking. The traditional choice would probably be a simnel cake for Easter, but whilst I know my father would be completely enraptured with this idea, the Perky Kebab is most definitely not a fan of fruit cake, regardless of how much marzipan you throw at it! 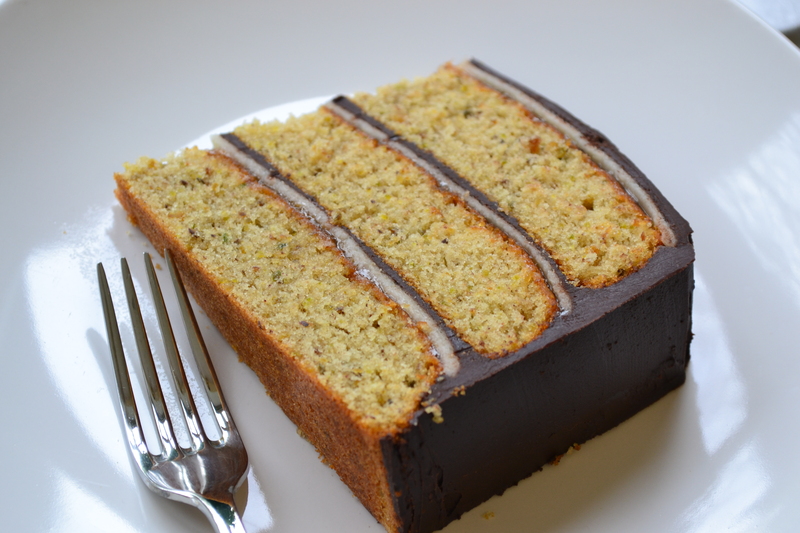 I’m not going to lie, this cake does take a bit of effort… And time, if, like me, you only own two 8 inch cake tins rather than the 3 required! It will take even more effort if you follow Leite’s instructions and make your own marzipan – life is too short so please don’t!! The bought stuff is just as good in my opinion. After making this on numerous occasions, I’ve made a few changes along the way to Leite’s original recipe. I’ve increased the amount of pistachios to get the flavour coming through a little more and also added a couple of drops of almond extract to try and bring out the nutty flavour a little more. 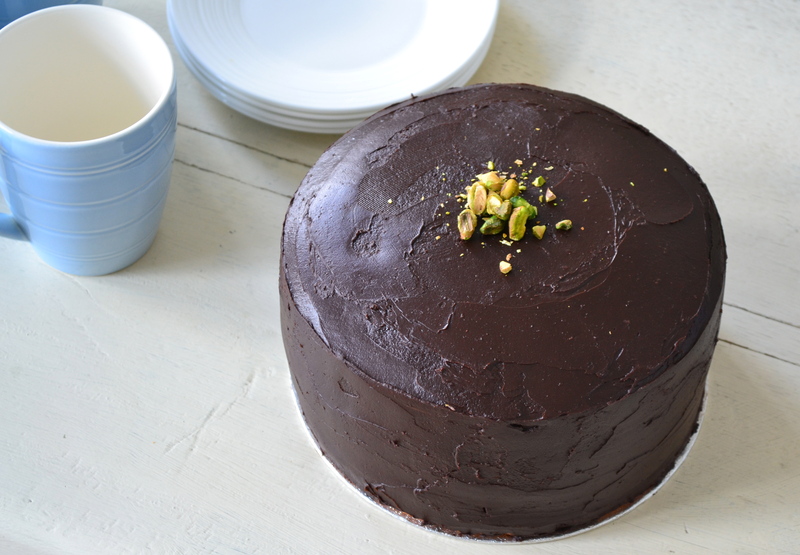 Ideally I would add some pistachio extract but I’ve never been able to lay my hands on any. I’ve also swapped the quantities in the ganache for those used by Mary Berry in her “Chocolate Obsession” cake as I find it works better. The end result really is divine making all the effort totally worth it. And the added bonus is that all the hard work means you definitely earned an extra large slice! Happy Easter! Have a great long weekend. A couple of drops of almond extract or pistachio extract if you can find it! 5 medium eggs, lightly beaten. 1. Preheat the oven to 190°c/170°c fan/350°f. Line and grease 3 8 inch round cake tins. 2. Place the pistachios on a baking tray and roast in the oven for 7-10 minutes until they smell deliciously toasted – keep an eye on them though, they can burn quickly! 3. Once the pistachios have cooled, place all but a small handful in a food processor together with the sugar and blitz until they are finely ground. 4. Pour into a large bowl, together with the flour, baking powder and salt and mix together either with a hand mixer or in a stand mixer on low for 30 seconds. 5. 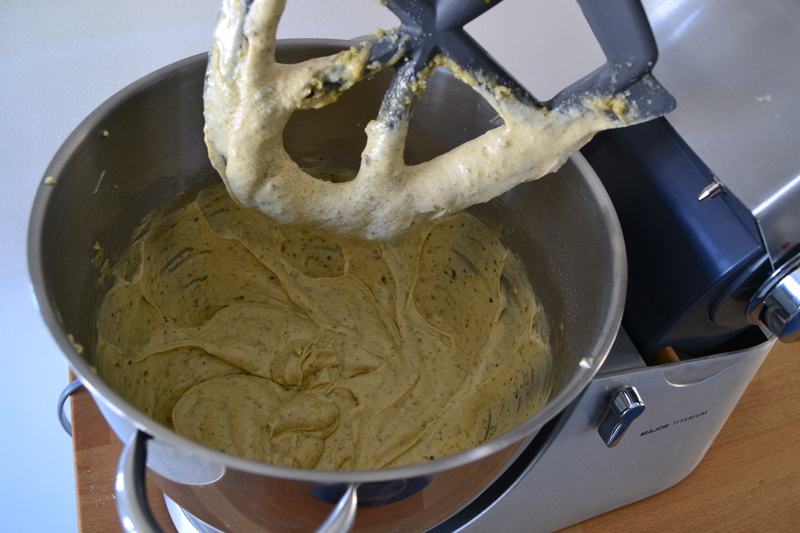 Add the milk, butter, vanilla extract, and almond/pistachio extract and mix until completely incorporated on a low speed. Increase the speed to medium and mix for 2-3 minutes until the mixture is pale and fluffy. Scrape down the sides mid way through to make sure everything’s mixed. 6. Add the eggs to the mix in 2 or 3 additions, scraping down the sides between each addition and only mixing enough to incorporate them. Divide the batter between the 3 cake tins. Bake in the oven for 25 minutes until golden and cooked through (test using a toothpick/skewer – it should come out clean when inserted into the centre of the cake). 7. Allow the cakes to cool for 5 minutes in their tins before turning out onto a wire rack to cool completely. Meanwhile, prepare your marzipan and ganache. 8. Marzipan: Roll out on a surface dusted with icing sugar to about the thickness of a pound coin (just under half a cm). 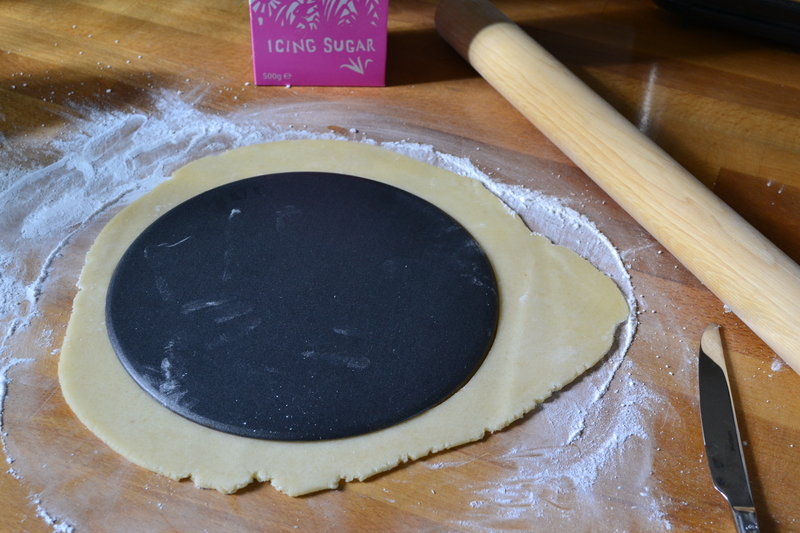 Using the base of one of your cake tins, cut out 3 circles of marzipan. Set these aside, covering either with some cling film or a tea towel to prevent it drying out too much. 9. Ganache: Heat the cream in a saucepan over a low heat until small bubbles start to appear around the sides – don’t let it fully boil though. Pour over the chocolate pieces and allow to stand for a couple of minutes before mixing together to make a glossy delicious chocolate paste. 10. Assemble the cake: Take one of your sponges and spread 2 tablespoons of apricot jam over the top. Place one of the marzipan circles on top and then spread on a layer of ganache (about 3 tablespoons). Place your next sponge on top and repeat the process. Place the final sponge on top and add the jam and marzipan. Pour half of the remaining ganache over the top, spreading it down the sides. Add the rest of the ganache on top, again spreading it down the sides. 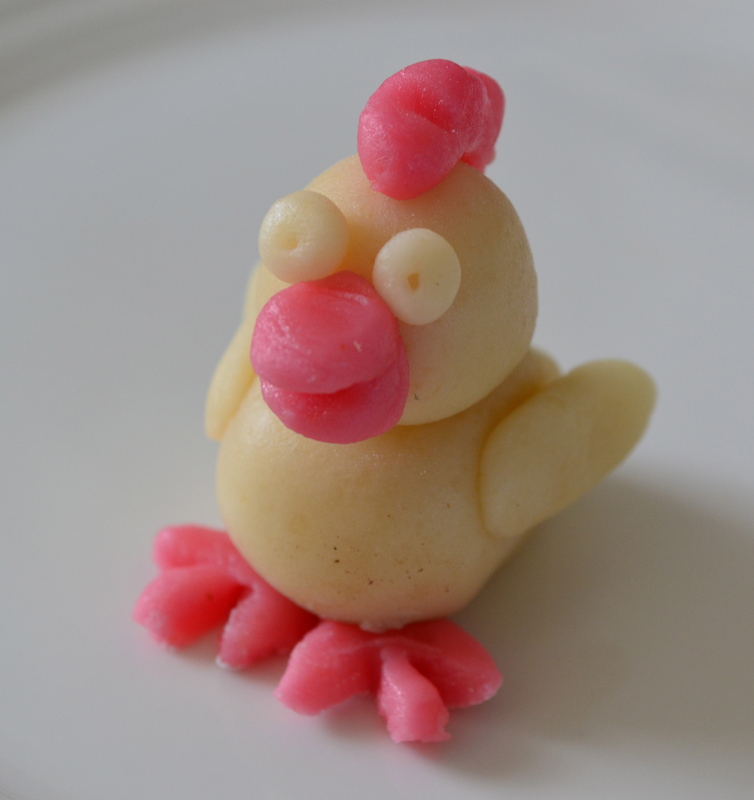 Decorate with the remaining pistachios and some marzipan roses if you wish or perhaps a chicken as it’s Easter! A very lovely cake. I can see it takes great effort and I am sure the award is heavenly! Very pretty.